Reader, don’t be startled by the photo of Mark Twain, AKA George McDaniel. Twain is not the new writer for the print edition, alluded to in the header– George is. 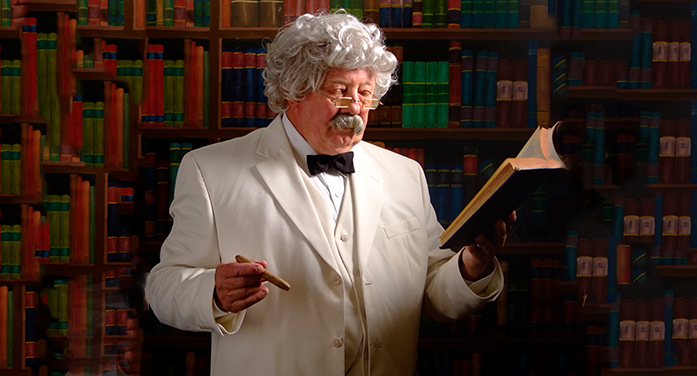 He has played Mark Twain in one-man shows for years, about 400 performances to be exact. The Advertiser asked for the Twain impersonation photo of him, for many know him from these performances. George claimed to this newspaper that he is not a writer, but for those who saw his response (published 4/13/16) to Dr. Mims Mobley’s Memoir printed serially through the early part of this year, these readers are likely to disagree, as this newspaper did. As a result of his article, the Editor summoned from him articles about his home town of Trenton, for the Advertiser has wanted for some time to have stories about Trenton for publication. And these stories begin this week, in the print edition. George graduated with a class of 52 students in 1955 and worked for two years before entering college, at Newberry. 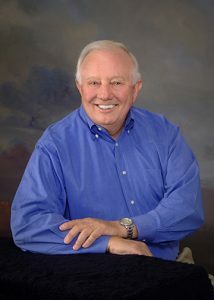 His years there were productive, and he worked during that time in businesses that led to his career in banking. Along the way he gained a great deal of information, through reading, about Mark Twain and decided to do the one-man show using Twain’s stories and dressing as Twain. He was aware of Hal Holbrook and his performances; in fact, when Holbrook came to Newberry to see his wife perform at the Opera House there, George got to have dinner with him and to commiserate over their performances. It is a fact that George McDaniel is a story teller. Sit with him a few minutes and those minutes extend into two hours – more or less. These stories he has collected for the Advertiser reader and put into publication form. It is for certain that readers will enjoy them.